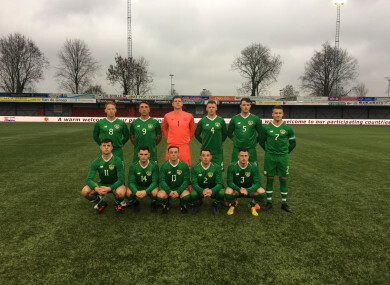 The Irish Defence Forces went through after taking four points from two matches in the Netherlands. IRELAND’S DEFENCE FORCES are off to China next year after booking their place at the CISM World Military Games today. The Boys in Green took on France at Ijsselmeervogels Stadium in the Netherlands this morning, and both sides came into the game on the back of a 4-0 win over Lithuania. Victory would have guaranteed progression as group winners, and Ireland were handed an advantage just 10 minutes in when a French player was red-carded for kicking David Long. St Mochtas midfielder Sean Poutch was excellent in the middle of the park, while Lee Delaney, Tony Smith and Chris Kenny were all thwarted by the France goalkeeper during the opening 45 minutes. Down the other end, Kevin Deegan and the Irish defence had to deal with a couple of counter-attacks from the 10 men. Ireland tired in the latter stages of the second half despite the numerical advantage but Kenny had two late chances to seal three points. The first, a chipped effort, clipped the bar before he was kept out be the French number one. Neither team could be separated after 90 minutes and it ended in a scoreless draw — meaning they both finish on four points with a goal difference of four. With three nations qualifying from two mini-groups of three, Ireland go through as winners due to the fair play rule, while France take the best runner-up spot. Greece progress from the other group, meanwhile. “This is huge,” manager Capt Richie Barber told The42. “There has been a bit of negativity going around about the army recently, but it goes to show that these lads will do anything for the cause. They’ve been overseas, have come home and they have given everything when they put on the green shirt. He added: “This is the cumilation of a years’ planning and work from the staff and players. We set our goals and achieved them. We could have won the game today but we achieved what we came to do. I can only praise the backroom staff and players for their commitment and desire. “I must mention the staff Colm Kavanagh, Anthony Jinks, Lloyd Murphy and Frank Carolan, who have given personal time to ensure the team were 100% ready for anything. It is only the third time Ireland have made the World Military Games, and Capt Barber’s squad will now prepare for next October, when they will get the chance to test themselves against the world’s top nations in Wuhan City. Email “'This is huge' - Ireland qualify for Military World Cup after draw with France ”. Feedback on “'This is huge' - Ireland qualify for Military World Cup after draw with France ”.